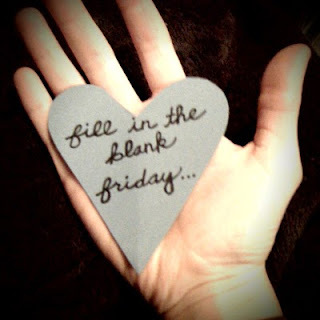 Time for Lauren's Fill in the Blank Friday! Lauren has quickly become one of my favorite blogs to read. You should hop on over. She's adorable! And i love the fill in the blank meme! If you'd like to join in, just copy the following questions in your blog & fill in the blanks! Then go to Lauren's & add your link to the blog hop at the bottom of her post (it'll tell you how)! 1. One thing i MUST do before I die is be a mommy. I definitely want to travel a lot too. Go on another missions trip. But be a mommy is of utmost importance! 2. I would rather clean your house than have to play a game of softball with you any day. 3. If i could give my younger self one piece of advice it would be Get some exercise. Don't eat away your troubles or you will pay for it as an adult. Don't let other people tear you down. You are of worth! 4. If i won the lottery tomorrow i would pay off the little debt we have, put the rest in the bank & then start looking for a house! And i'd plan a vacation. 5. The best surprise ever was when Brad proposed. I knew we were going to get married but i had no idea he was going to propose THAT soon! I was thrilled. 6. My biggest fault is I can be really unmotivated & lazy. Not lazy as in sitting on the couch all day eating bon bons! I will clean my house & go for a walk! But if i have a goal i want to accomplish it takes me FOREVER just to even get started. Queen procrastinator. 7. My biggest strength is that I am completely accepting & unjudgemental. Some Christians are horribly judgemental without even realizing it. You do not have to love sin to show people love. I am able to see truth & love truth & also love people who don't live by that truth. Unconditionally. Awesome answers and super cute blog! I agree being a mother is one of my favorite titles! It is truly a blessing. I'll take you up on the cleaning my house for not playing softball... that is hilarious!